Many people suffer of headache and migraine which may occur and disappear from to time to time. The reason for it may be different: dehydration, pressure and other factors. If you feel the signs of migraine, first thing you should do is drink a glass of water. This way if your body is dehydrated the headache will probably disappear. But if it still persists, there are some foods that can help you fight the symptoms. Here you will learn ten proven foods which help relieve headache. 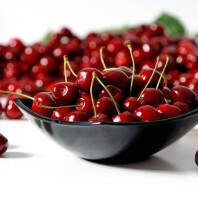 Cherries have the property to relieve headache. The main reason for this is the fact that they contain quercetin which has anti-allergy, anti-oxidant and anti-inflammatory properties. This compound helps the body stop feeling pain and blocks its sensitivity. To relive a migraine or headache eat twenty cherries. If you prefer you can drink a glass of cherry juice which has the same effect. Coffee taken in moderate quantity can help relieve headache, thanks to the caffeine it contains. Caffeine shrinks blood vessels and fights headache. Don’t take too much coffee because it will dehydrate your body and increase your headache even more. Salmon contains lean protein which stops the headache and provides long-lasting energy for the whole day. It also stabilizes the blood sugar. This meat is full of omega-3 fatty acids that are proven to decrease the duration, heaviness and frequency of headaches. Eating processed meats and foods which contain high level of sodium make your body dehydrated, worsening your headache. It is recommended to eat salmon two times a week to supply your body with B vitamins and significantly improve the function of your brain. Whole grain foods like porridge and millet have B vitamins and magnesium, which block the headache completely. This makes these foods healthy and a proven cure for headaches. You can eat whole grains many times in the week for breakfast, lunch or dinner. They are light, nourishing and appropriate for different diets. Spinach is one of the super foods, which purifies the skin, helps your hair look brilliant and can be used to stop headaches. Like whole grains and salmon, it contains vitamin B. This vitamin makes your body more relaxed and relieves all pains in it, including headache. A spinach salad is perfect for lunch and will definitely stop your headache. All spicy foods like hot peppers, sriracha and spicy salsa ease headaches, caused by sinus problems. Spicy foods will cleanse your sinuses and respiratory system, Balham SparklingCarpets are saying. This will soothe pressure and headache. So spicy chips, foods and sauces can be healthy. Corn and all foods which contain a lot of B3 vitamins, maintain the function of the blood vessels and soothe the nerves. If you don’t consume enough B3 vitamins, this can lead to not being able to cope with the stress in everyday life and headaches as a result of this. If corn is not one of your preferred foods, you can replace it with tomatoes, beans or potatoes. Vitamin B6, B3 and B2 are capable of stopping and reliving headaches. B6 is contained in bananas and is known as an antidepressant. It decreases the pain in your body and cures mental weariness. So bananas are another foods which relieve headache effectively. Dehydration is a major cause of headaches so instead of taking a pill, you can consume a watermelon slice. It contains a lot of water and will fight the dehydration easily. You can make a smoothie or a fruit salad with watermelon and other fruits. Flaxseed contain omega-3 fatty acids that’s why they have a lot of healthy properties. They stop migraines because of their anti-inflammatory qualities. You can add flaxseed into your porridge or bake them on your bread or in muffins. There are some foods which cause headache. These are cheese, processed meet, artificial sweeteners and caffeine (in case you are not used to coffee or drink too much). They can trigger headache and should be avoided, while the mentioned foods above relive it effectively.